In January of 1942, following the outbreak of World War II, a newspaper in Flint, Michigan advertised a meeting for mothers of servicemen, led by Captain George H. Maines. Hundreds of mothers attended this meeting. Today, Blue Star Mothers support each other, send Freedom Boxes and letters of encouragement to our troops; help our wounded service people, volunteer in VA hospitals, and work with veterans. We show our children and America's sons and daughters that we appreciate them and their service to our Country. 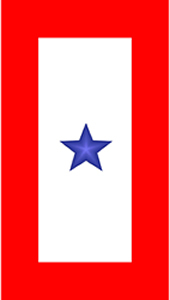 The Service flag, also called the Blue Star Flag, was designed and patented by WWI Army Captain Robert L. Queissner of the 5th Ohio Infantry who had two sons serving on the front line. The flag quickly became the unofficial symbol of a child in service. President Wilson became part of this history when in 1918 he approved a suggestion made by the Women's Committee of the Council of National Defenses that mothers who had lost a child serving in the war wear a gold gilt star on the traditional black mourning arm band. This led to the tradition of covering the blue star with a gold star on the Service flag to indicate that the service member has died.